Have you heard of ‘The Writer Competition 2014’? | Precious Thoughts! Have you heard of ‘The Writer Competition 2014’? 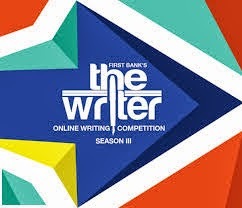 The Writer is an online ‘reality’ writing competition created by First Bank of Nigeria plc. and TheNakedConvos and the competition is now in its third year. Contestants are given a topic or theme to write on each week and you, the public, as well as our judges, assess them and vote to keep the best writers in the competition until we have one writer left standing, our winner – The Writer. Over the last two years, we have had great competitions but this year, everything changes. We are going bigger and better with more evictions every week and more prize money at stake. 12 finalists will be shortlisted from the qualification entry submissions based on the quality of their flash fiction. These writers will be mentored by our judges and will contest in four rounds of the online writing competition where we will evict three contestants every week. The competition will require all writers to send in their themed stories weekly by a fixed deadline. Posts from contestants will be put up for members of the public to read and vote for. The public votes from the audience and the votes from the judges will be combined and based on this contestants will be judged and eliminated weekly until a final winner – THE WRITER – emerges. The competition is for all Africans who love to write. There is no age, nationality or location restriction. All Africans or people of African origin are encouraged to send in pre-qualification entries to be considered. To stand a chance to qualify for the competition, simply write and send in a flash fiction story that is not more than 500 words long (It can be less than this but definitely not more). The theme for this year’s entry stories is “The First”. The first –what? That’s entirely up to you. The first kiss. The first story. The first bite. The first child. The first car. The first man. The first word. Anything. It can be about a time or a place or a person or a situation or anything along the continuum. Be creative. Any Style, direction and format is allowed – the more creative and well written, the better your chances of qualifying. Send your entry to thewriter@thenakedconvos.com on or before midnight, February 21st, 2014. Submissions must be Flash Fiction stories. Poetry and Opinion pieces will NOT be accepted. Only shortlisted writers will be contacted. Writers will be contacted only by e-mail. Please include your full name, gender, location, phone number and a valid e-mail address in your submission which we will use for continued correspondence, even if it is the same email address you use to send in the entry. TheNakedConvos reserves the publication rights to the shortlisted stories and may publish them later on the site. NOTE: All prizes are in US dollars. Deadline for submission of entries is February 21, 2014. The Judges and 12 Finalists will be announced and The ‘Show’ will begin in March 2014. The ‘Show’ will end, the winners be announced and prize money awarded in April 2014. You can review the last two editions of the competition using the link below. The Writer Season 2 – sponsored by First Bank. Get excited. Get ready to read. Get ready to write. Get ready to judge. Get ready to vote. New Rules, Same Show, THE WRITER SEASON THREE BEGINS NOW! I wish I were a writer.